3 bedrooms, 2 bathrooms, living/dining room, kitchen, enclosed porch, single carport, covered roof-top deck with PANORAMIC OCEAN VIEW. POOL PRIVILEGES @ DAYS INN. MW, DW, W/D, 2 Cable TV's, DVD, WiFi/DSL, NO PETS, NO SMOKING. BEDS: 2 Queen, 2 Double, single bunk beds. Accommodates 10. Arrangements for linens, etc. should be made at least 2 weeks prior to arrival. This home is where we've celebrated Thanksgiving for 5+ years and counting. It is an older home, but offers 3 bedrooms and 2 baths. The crow's nest is a nice place to catch a pretty sunset once in awhile. The kitchen has great dishware but needs new pots/pans and cooking utensils/. We really enjoyed staying in the Atlantic Tabby! It was clean, well laid out, and very spacious. The property was clean and as expected. It was disappointing that the beach access near the home is closed. There is a locked gate saying that there are security cameras and it is illegal to use the path. The state is apparently using the area where the path is as a nature preserve. So in order to get to the beach, it is a 10 min drive, not a 10 min walk as I had hoped. The description needs to be changed. Property was in excellent condition, clean and ready, and well maintained. Wireless internet and Satellite service provided. A pleasant vacation experience! We encountered a few issues with the property we rented for the week. However, Jekyll Realty worked diligently to solve these issues and to my satisfaction. I appreciate a company who strives to make their customers happy and therefore we will continue to choose Jekyll Realty for the upcoming years. My family and I visit Jekyll Island yearly and have chosen Jekyll Realty every year for the past 10 yrs with the exception of once. Jekyll Realty Staff are great & friendly and aim to please their customers! The South Beach is nice and peaceful but having no beach access from the house was disheartening. Not against you South side but we will stick to the North Side. We missed the deer that visit every year on the N side. There are a few on the South but they are not tame like the N side. We always enjoy our time on Jekyll especially at the south end. It is very peaceful & quiet. We could even hear the ocean from Atlantic Tabby. The layout of the house was perfect for visiting kids & grandkids who had the upstairs while we had our privacy downstairs. The house unfortunately has continual water leak problems which need to be addressed and the windows during the winter are very drafty. We had fun watching all the wildlife in the backyard (deer, rabbits, squirrels, birds, & raccoons). Jekyll Island Realty is terrific to deal with. We have rented this house for the past 5 years for Thanksgiving. It has been wonderful. The new flooring on the first level is terrific. The kitchen pots, pans and cooking utensils could be replaced. Due to our use of the kitchen for preparing a Thanksgiving meal, updating these outdated items would make a big difference. Also of note for inspection are the sloping floors on the second floors most likely caused by old roofing and water damage. It seems that this has progressed over the years and might be a concern. We usually stay on the other end of the island but the south end was quiet and very peaceful. The house was wonderful and fit our family's need for the long weekend. 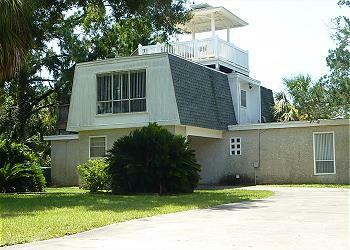 Atlantic Tabby is on the quiet end Jekyll, good for nature lovers and those who like a laid-back vacation. You're reasonable walking distance to St. Andrews picnic area/beach access and the soccer fields beach access. There was a nature trail from the neighborhood to the beach (bring insect repellant!) in August 2017. The bike trail is a stone's throw away. The natural light in every room of the house, especially the Jekyll room, is great. The living room is spacious and comfortable with satellite TV and lots of books to choose from. While you only get distant ocean views any more, it's still nice to sit on the roof deck and enjoy the breezes or watch the clouds go by. A larger group might find the kitchen too small, but it worked well for my needs. The downstairs bedroom was quite comfortable; I can't speak for the upper rooms. I enjoyed my stay at Atlantic Tabby. I found the folks at Jekyll Realty to be friendly and helpful. The welcome packet answered all my questions, and the welcome gift was a nice surprise! Excellent home. Wonderful view from deck. Fun adventurous path to beach. House clean as whistle and comfortable. Our favorite house on our favorite end of the island. We always enjoy staying here with our family. Walking at St. Andrew's Beach and touring the historic Jekyll Island Hotel and surrounding cottages. Many reviews state that this house needs updating. I've stayed in various houses on Jekyll over the last 50 years and although an update would be nice... this house is similar to almost every other rental house on the island. The location is awesome, if you want the seclusion of the south end of the island. The lay out of the house is great, no bedroom walls are adjoining and no bedrooms adjoin the living room. Crows nest on the top is an added plus. My 5 star rating is based on a comparison to the many other houses I've stayed in, not a comparison to the Marriot. We have a large family and this property provided the space we needed to spread out. "Path" to the beach was very hard to travel and disappointing. Living room carpet was very dirty, appliances worked great and were sufficient, washer/dryer were very handy, sufficient parking---we had a boat also. The kids from our youth group liked the house. There was enough space and it was clean. THE HOUSE WAS GREAT BUT NEEDS A LITTLE MORE AC UPSTAIRS. BUT OVER ALL EVERYTHING WAS FINE.